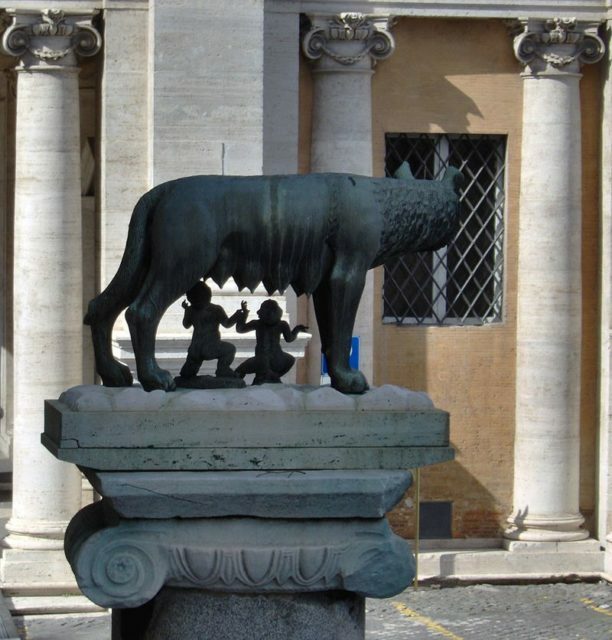 Considered as a representation of the ancient legend of the founding of Rome, the famous ‘Capitoline Wolf’ made of bronze it’s a good example of the appearance of the first sculptures in ancient Rome. 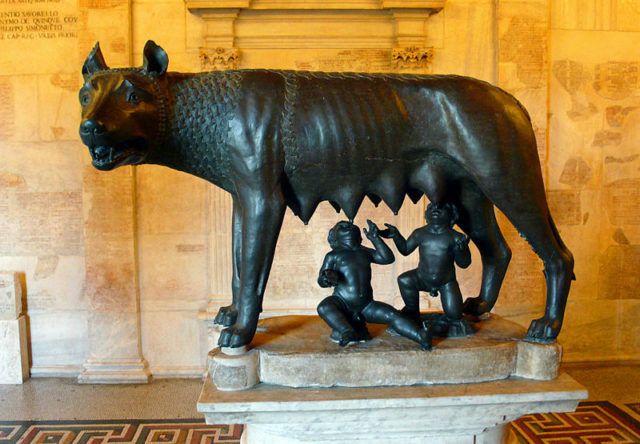 The symbol of Rome and her unusual form with suckling twins was related to many legends. The most dramatic, widely known and accepted by the Romans, is that the twins, Romulus and Remus, were rescued by the wolf. Apparently, they were cast into the Tibet River by order of their grandfather’s brother. The wolf took care of them until they could be taken by a herdsman. 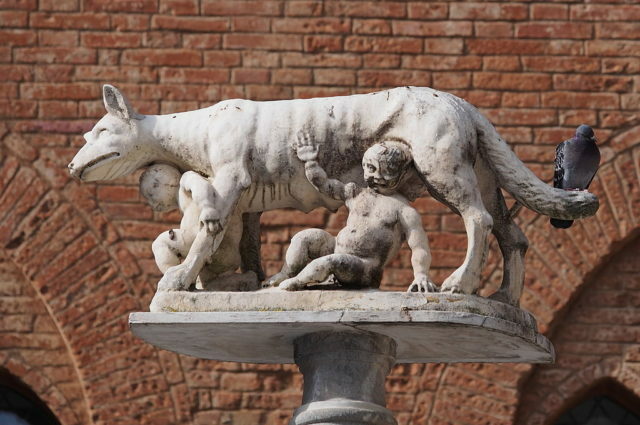 When they grew up, Romulus and Remus took back their grandfather’s kingdom and established a city. The legend ends with Romulus killing his brother, and that’s how the history of Rome begun. 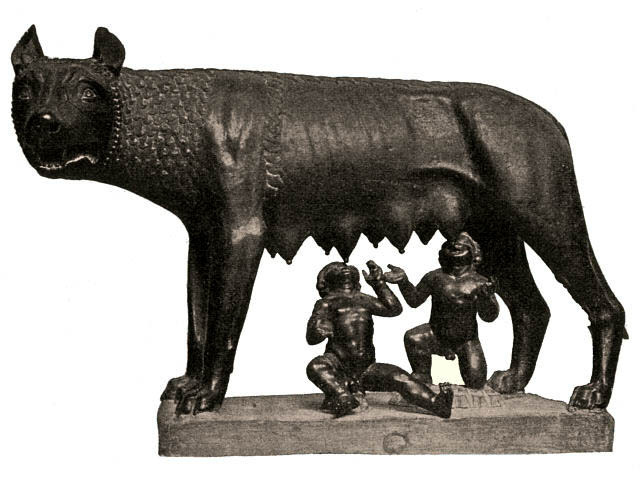 It’s believed that the symbol of the Roman Empire, ‘Capitoline Wolf’ was over 2000 years old. However, it was proven that the sculpture was made in the middle ages. At first, the sculpture was described by Cicero, due to the presence of damage to the sculpture’s paw. It was believed to correspond to the lighting strike of 65 BC. The 18th-century German art historian, Johann Joachim Winckelmann, attributed the status to an Etruscan marker in the 5th century BC. His statement was based on how the wolf’s fur was depicted. It was first attributed to the Veiian artist Julia, who decorated the Temple of Jupiter Capitolinus and re-attributed to an unknown Etruscan artist of approximately 480-470 BC. Winckelmann correctly identified a Renaissance origin for the twins. It’s assumed that they were probably added in 1471 or later. Many questioned Winckelmann’s dating of the bronze during the 19th century. The secretary of the Archaeological Institute of Rome, August Emil Braun, in 1854 proposed that the damage to the wolf’s paw had been caused by an error during casting. In 1878, the Conservator of the Louvre, Wilhelm Fröhner stated that the style of the statue was attributed to the Carolingian period instead of the Etruscan. Wilhelm van Bode, the German art historian, and curator, also stated that the statue was a medieval work. All of these statements were disregarded and forgotten by the 20th century. However, the University of Salento finally resolved the question in February 2007. It was proven that 95.4 percent of the sculpture was crafted between 11th and 12th century AD.